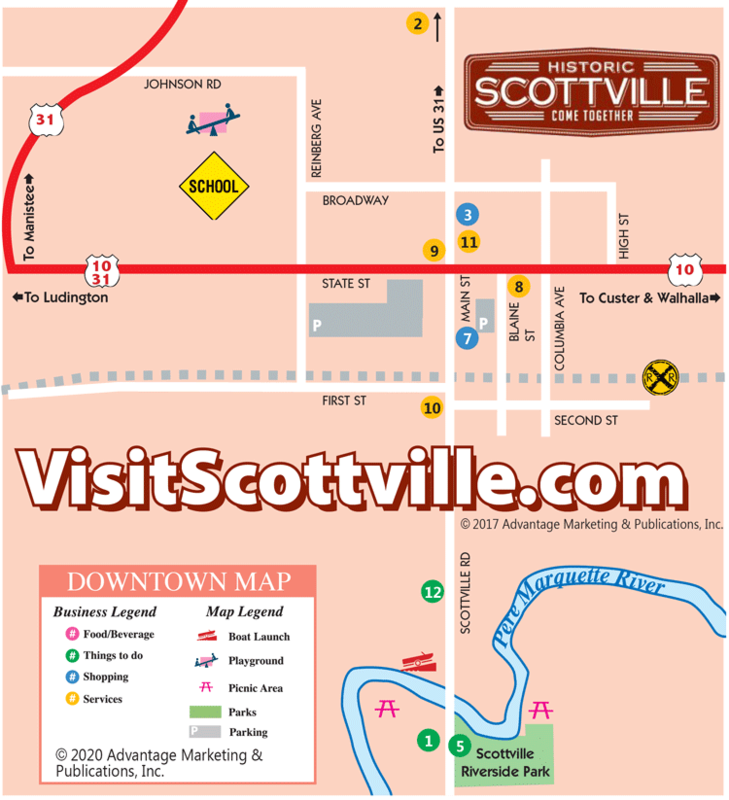 Scottville is the home of two "famous" attractions: the wild and zany Scottville Clown Band and the Old Engine Club. The Scottville Riverside Park, on the Pere Marquette River, has over 50 full service sites--and a swimming pool--perfect for tent and trailer camping. 1 - Henry's Landing Camping & Canoe Rental, (231) 757-0101. 2 - Ziehm L.P. Gas, (231) 757-3775. 3 - Cole's Antiques Villa, (231) 936-1123. 4 - Bow's Diner, (231) 757-9840. 5 - Scottville Riverside Park, (231) 757-4729. 7 - Holden's Home Emporium, (231) 757-8733. 8 - Mason County District Library, (231) 843-8465. 9 - Scottville Police Department, (231) 757-4729. 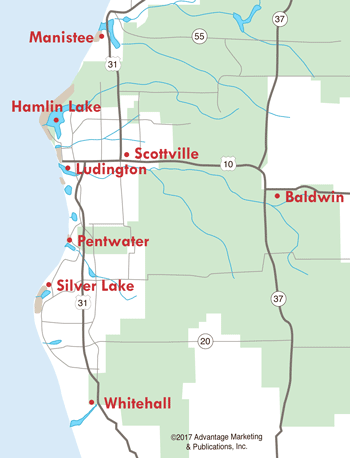 10 - Scottville Post Office, (231) 757-2474. 11 - North Country Cafe, (231) 757-3993. 12 - River Run Canoe Rental, (231) 757-2266. 14 - Scottville Area Senior Center, (231) 757-4705.